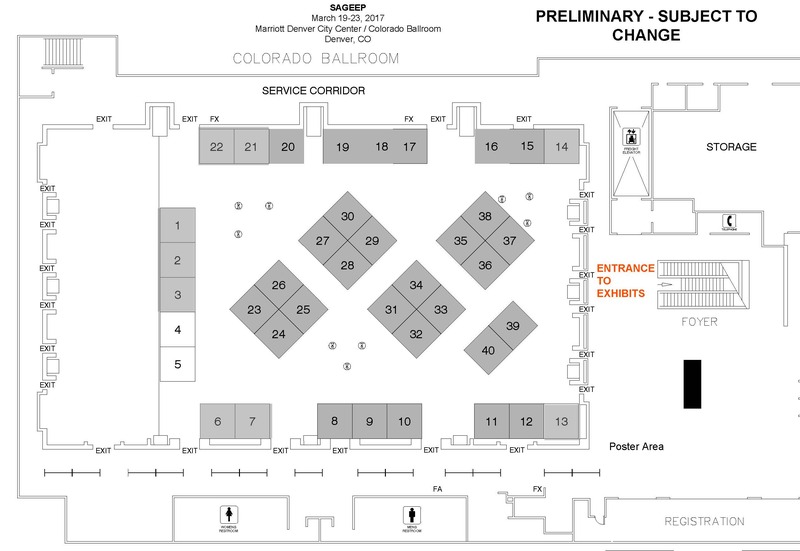 The SAGEEP 2017 Exhibitor Prospectus lists remaining sponsoring opportunities. Please contact the Exhibits Manager (contact information below) with details and questions. Aarhus GeoSoftware (AGS) is a provider of commercial software for processing and inversion of geophysical data. AGS has developed a common platform for handling many types of geophysical data, where the workflow goes from raw data to processing, inversion, quality control results and visualization of inversion models. Advanced Geosciences, manufacturer of the SuperSting electrical imaging systems with real-time visualization and remote control with wireless App and the EarthImager modeling software. These systems are used for Geotechnical Exploration, Marine Engineering, Groundwater Exploration, Mineral Exploration, Pollution Mapping, Shallow and Deep Marine Hydrocarbon Exploration, Agriculture, Archeology and Landfill Management. Andes Earth Imaging offers ready-for-deployment devices for DC-Resistivity and Seismic Refraction surveying for sale or rent. Our devices have been developed by a superb team of engineers, mathematicians and geophysicists. We strive to make the world's user-friendliest geophysical equipment. Our devices have been sold to clients all over the Americas. Bird Seismic Services has the experience and equipment to properly record your data. Since 1991, we have recorded hundreds of surveys in North and South America in all types of environments for all kinds of needs. We take matters beyond face value surface and below with proven results – nothing short of seismic. The European Association of Geoscientists & Engineers is a professional association for geoscientists and engineers with 19,000 members worldwide. EAGE has two divisions: Oil & Gas Geoscience and Near Surface Geoscience. EAGE and SAGEEP have a long-lasting relationship in exchanging knowledge where it concerns Near Surface. For many years now SAGEEP has included the best of EAGE papers from EAGE’s Near Surface annual meeting and vice versa. Exploration Instruments is the best-known geophysical equipment rental firm in North America specializing in near-surface applications. We maintain a diverse inventory of 85 different systems including seismic, radar, EM, gravity, magnetics, resistivity, radiometrics, hydrologic, marine and borehole logging tools. Offices in Austin, Texas and Harrisburg, PA are ideally situated to service projects world-wide. GEM Systems is a world leader in manufacturing the most advanced Magnetometers and Gradiometers that are accurate, reliable and cost efficient. They are used in approximately 150 countries Worldwide for UAV-Drone, Airborne, Mineral, Oil Exploration, Observatory, Volcanology, Earthquake Research, Archeology, (UXO). Products include Potassium, Overhauser, Proton, VLF and others. Geodevice, a Russian geophysical company, is based in Saint Petersburg, Russia and designs, manufactures, and supplies equipment and software for geophysical surveys. Besides distributing its own unique developments, the company is an authorized dealer of many leading Russian and global geophysical companies. We offer research activities and educational courses for our clients as well. As a leading worldwide software provider, Geogiga is dedicated to producing simple and powerful software packages for Reflection, Refraction, Surface Waves and Borehole Seismic in near-surface geophysics. This show will highlight the latest release of Geogiga Seismic Pro. Geomatrix Earth Science Ltd offers one of the largest international short term hire pools of near surface Geophysical Instrumentation in the world. We are retained as exclusive sales representatives by many of the leading geophysical instrument and software manufacturers for products such as GPR, magnetometers, seismographs etc.… offering many of their marine and terrestrial systems for rental. Geonics Limited is a world leader in the design, manufacture and service of electromagnetic geophysical instrumentation, including Ground Conductivity Meters and Borehole Conductivity, Magnetic Susceptibility and Natural Gamma Probes, Metal Detectors and the PROTEM Time Domain Electromagnetic (TDEM) system. Since 1962, Geonics has earned a reputation for producing reliable, cost-effective instruments for an increasingly diverse range of applications. Geosoft provides industry-standard software and custom solutions to integrate, visualize and analyze all of your near surface geophysical, geological, and geochemical data. Contractors, consultants, government, and industry use Geosoft’s software to map and analyze airborne, ground and marine survey data for a variety of projects such as geotechnical, environmental site investigations, archaeological and unexploded ordnance (UXO) detection. GEOSTUFF manufactures essential seismic accessories including the AnySeisTM cableless exploration seismograph, wall-lock borehole geophones, land streamers, and rollalong switches. Our products are used worldwide for collecting refraction, reflection and MASW data along with near surface shot-hole logging, static corrections, and engineering site response. A global leader in technological innovation for airborne geophysical survey mapping, interpretation/analysis. The clarity of our data lets you see with accuracy and detail what’s beneath the earth, from near surface to great depths. We work closely with clients to identify and implement solutions meeting specific project goals. - magnetic susceptibility meters for single - or multi-depth field surveys (Multi Kappa, Multi Kappa 3L). GISCO specializes in professional grade instruments for civil engineering, and oil, mineral and ground water exploration. Of particular importance are our Electrical Seismic Sources, Radio Trigger Links and Trigger Switches. Our exports of earth science equipment supplies have reached more than seventy countries. Hager GeoScience, Inc. (HGI) is a small, woman-owned business that has been providing exceptional consulting services in geophysics within New England, the US and internationally since 1993. Finding innovative solutions to subsurface problems is our specialty. We provide sophisticated analytical techniques using computer-assisted data acquisition and state-of-the-art equipment. Our products can be used in a variety of applications from Utility Locating and Mapping to Civil Engineering and Slope Monitoring. A world leader in Multi-Frequency, Multi-Channel Ground Penetrating Radar systems, and a pioneer of Interferometric Technology applied to Civil and Earth applications. I•GIS is a specialized geoscience and GIS software and service provider since 2002. Our main product suit is a geodata management system consisting of GeoScene3D and GeoCloud, for constructing 3D geological models, and distributing these together with GIS and geoscience data using cloud based services. IRIS INSTRUMENTS, a BRGM and OYO group joint venture, designs, manufactures and markets instruments. It also proposes rentals and in-the-field training. Through our world leading brands of geophysical equipment, ABEM and MALÅ, and our partner companies we offer best-in-class integrated end-to-end solutions to challenges worldwide. With a truly global footprint we draw on extensive experience since 1923 of innovative, field-tested and trusted solutions including: TEM, GPR, Resistivity, and Seismics. Micro-g LaCoste and Scintrex are the gravity specialists, meeting all your gravity requirements. We are pleased to introduce the new CG-6 Autograv™ gravity meter succeeding the industry standard CG-5. Now specializing in Microgravity Surveys either surface or borehole. Will a gravity survey help? Our Gravity Feasibility Studies can tell you. Mount Sopris Instruments designs manufactures, and supports geophysical logging systems around the world. Offering the most comprehensive 1 ne of slimline products with unparalleled customer support, Mount Sopris is committed to meeting the evolving needs of its customers. Come see us at Booth 32 to see what's new! Northwest Geophysics is a full service geophysical equipment rental company supporting environmental and engineering projects with the most diverse inventory of land, borehole logging, and marine geophysical systems. We also offer a wide range of LiDAR and GIS mapping systems for geological and civil infrastructure surveys. Visit our webpage: www.nwgeophysics.com. Ontash & Ermac, Inc. introduces OEM SIP Sonde Electronics and Portable Field/Lab SIP Unit (PSIP) and accessories. The PSIP is a multi-channel high-end SIP tool for laboratory and in situ near surface SIP measurements. The SIP Sonde Electronics perform SIP measurements and are designed for easy integration into existing Sondes. Pro-seismic Services, LLC is a manufacturer of custom cables and multi conductor seismic and resistivity cable. SkyTEM is a helicopter-borne geophysical system designed specifically to map aquifers. The technology is capable of resolving subtle geological contrasts that can define the location and potential vulnerability of aquifers. SkyTEM technology delivers digital data for creating detailed 3D geological representations from the very near surface to 500 meters depth. Founded in 1930, the Society of Exploration Geophysicists is a not-for-profit organization committed to connecting and inspiring the people and science of geophysics. With 27,000+ members in 138 countries, SEG provides educational resources to the geosciences community through publications, books, events, forums, professional development courses, and more. Visit www.seg.org. TechnoImaging offers modeling, inversion, and interpretation of geophysical data, including EM and potential fields acquired by airborne, marine, land, and borehole systems, and petrophysical and mineralogical analyses of rock samples as well, for consultancy for exploration and appraisal. Contract R&D for unique system/data is also available. Terraplus provides rental and sales for a wide range of geophysical instruments and software, including Magnetometers (Potassium, Overhauser, Proton), VLF, 2D/3D Resistivity/IP Systems, GPR, Borehole Systems including Televiewers, Magnetic Susceptibility and Conductivity Meters for soil investigations, Radiometrics, EM Systems, Seismographs, and more. Visit our website for more information: www.terraplus.ca. Vista Clara provides magnetic resonance solutions for direct imaging of groundwater and characterization of hydrogeologic properties, including porosity and permeability. Our cutting-edge surface NMR and borehole NMR technologies deliver high-value data to customers across the water resources, mining, environmental, and geotechnical sectors. Established in 2001, we’ve been devoted to developing and manufacturing geophysical equipment. For near surface surveys, we have 1Hz-100Hz geophones, seismic spread cables for all range of connections, resistivity cables, EM and IP cables as well as connectors and other parts. We offer custom-made services to bring your ideas to fruition within controllable cost and time. For 45 years, Zonge International has been providing contract geophysical field services, as well as manufacturing and selling a full line of state-of-the-art equipment for electrical and electromagnetic geophysics. Worldwide, we can provide crews, expertise, or equipment for resistivity, IP, CR, CSAMT, TEM, AMT, MT, or for your specialized research projects.